Custom paper napkins are almost indispensable for every holiday party. In fact, without personalized paper napkins Christmas parties will be a humongous mess! On average, most of party organizers assume guests use about 3 napkins each, and they would order some extras to have just in case of emergency situations like higher than expected turnouts, etc. The good things about using printed paper napkins for promotional purposes is they give you endless leeway for creativity with your logo. 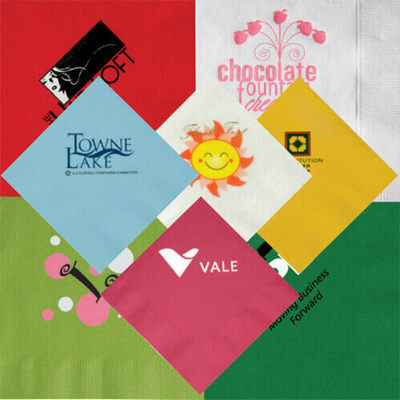 The imprint area for napkins is a decent size, and it allows you orient your logo in a square (standard), in a diamond layout, or have it printed small and elegant towards the bottom of the napkin or the top of the napkin, etc. Print wise, we have these options: regular silk screening prints, your logo in full color, foil stamping, embossed, or debossed. These options results in an elegant look for your overall brand image, and your Holiday guests will surely be impressed! Mix and match colors – at Promotion Choice, we offer you the opportunity to mix and match paper napkins Christmas colors! Create a Holiday theme, for example, with an order of 500 custom cocktail napkins, get 250 Green, and 250 Red napkins, and have your logo foil stamped in Gold to signify the colors of Christmas! How about getting all white branded beverage paper napkins screen printed with your logo in multiple colors? For example, for an order of 1000 promotional beverage napkins, have 300 printed with your logo in Red ink, 300 in Metallic Gold Ink, 300 in Green ink, and 100 in Blue ink – all the holiday colors! Note however, that we do have an up-charge for each ink color change though. So, for this upcoming Holiday, look at our promotional paper napkins, and order some to add the Christmas cheer and holiday fun to your party!